This necklace of over wintered Lackey moth eggs was found while searching for larvae beside the South West Coast Path at Porthgwarra , one of the best sea watching places in the extreme south west of Cornwall. The caterpillars had already begun to hatch and are the first we’ve seen this year. The eggs had been laid on an apple tree growing amongst the dense blackthorn hedging. 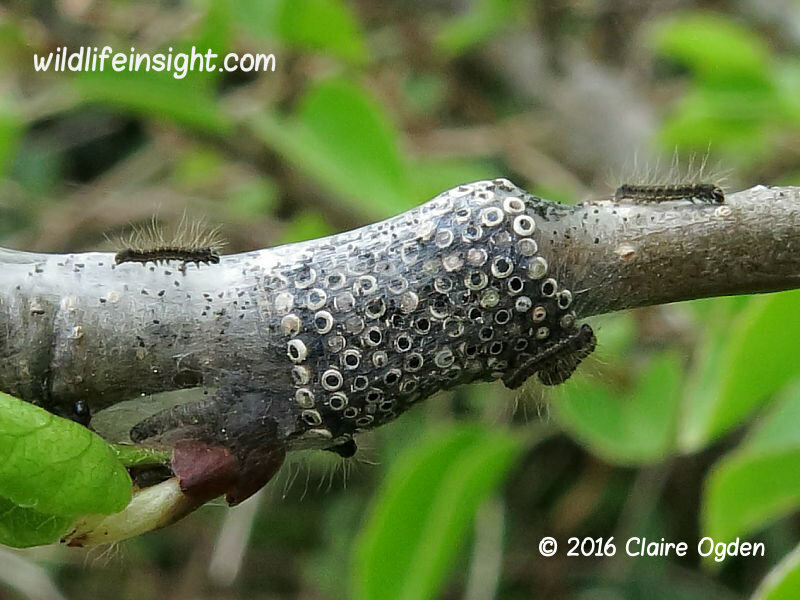 Follow this link for other commonly seen hairy caterpillars. It’s an exciting time of the year in Cornwall and the rest of the British Isles with many species of moth and butterfly emerging and larvae of other species hatching to feed on new buds and leaves. In other parts of the UK several sightings of Gothic moth caterpillars have been received. One particularly interesting sighting was of in excess of a dozen on a Cypress hedge – an update to follow. Elsewhere from around the world sightings included Lilly Borer, Citrus Swallowtail and a Convolvulus Hawk caterpillars from South Africa, a Spotted Oleander caterpillar from Puerto Rica, several Yellow Bears and Eastern Tents from various States in the USA and a Costa Rica Sphinx from Guyana in South America. Moths included a Golden Twin-spot from South Africa and David Brown reported a male Emperor Moth in Nottinghamshire. Many thanks for all the inquiries and sightings.